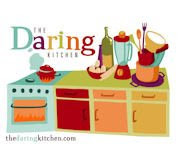 The August 2009 Daring Bakers' challenge was hosted by Angela of A Spoonful of Sugar and Lorraine of Not Quite Nigella. They chose the spectacular Dobos Torta based on a recipe from Rick Rodgers' cookbook Kaffeehaus: Exquisite Desserts from the Classic Caffés of Vienna, Budapest, and Prague. Dobos torta (/'doboʃ/, Hungarian: dobostorta, Slovak: doboška) is a famous Hungarian cake, famous also in Slovakia, invented by and named after a well-known Hungarian confectioner, József C. Dobos (1847-1924) in 1884. 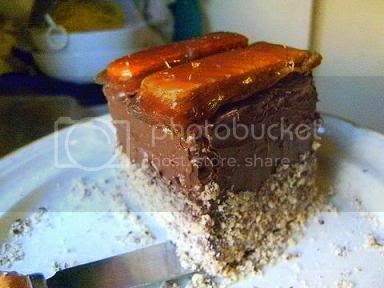 It is a five-layer sponge cake, layered with chocolate buttercream and topped with thin caramel slices. The sides of the cake are sometimes coated with ground hazelnuts, chestnuts, walnuts or almonds but the original cake is without coat, since it was a slice of a big cake. Dobos's aim was to make a cake that would last longer than other pastries, in an age when cooling techniques were limited. The caramel topping helps keep the cake from drying out. The cake is also often called 'Dobos-torta' or 'Dobostorta'. 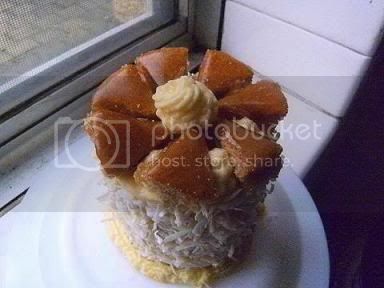 Dobosh or Dobos Torta (type of cake) was first introduced at the National General Exhibition of Budapest in 1885; Franz Joseph I and his Empress Elisabeth were among the first to taste it. The cake soon became popular throughout Europe as it was different from all others. It was simple but elegant, as opposed to the multi-storey, flaming cakes of the age. Its other secret was its use of fine buttercream, which was very little known at the time; cake fillings and frostings were usually made with cooked pastry cream or whipped cream. 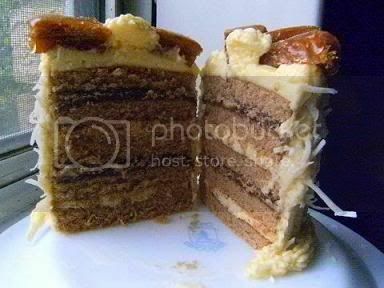 The chocolate buttercream and the batter of the cake were both invented by Jozsef C. Dobos. Dobos travelled around Europe and introduced the cake wherever he went. For a long time he kept the exact recipe confidential, until 1906 when he retired and gave the original recipe to the Budapest Confectioners' and Gingerbread Makers' Chamber of Industry, providing that every member of the chamber can use it freely. Dobos Torta is known everywhere in the world and there are more than one hundred recipe variations. 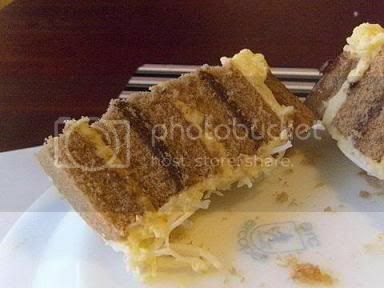 It is a commonly made torta in the upscale hotels, restaurants and pastry shops of the world. Thanks Angela and Lorraine for a fantastic choice. This was an effort it has 32 layers and I followed the recipe below I coated the layers of sponge with unsweetened coffee syrup. Tastes like elegance and definitely worth it. No real problems with any part of the challenge. Try it with coffee it is even better. I used ground hazelnuts on the sides and the toffee had a nice lemon after-taste that really set off the cake. (A lot of the Daring Bakers' found the buttercream was too soft and that the lemon wasn't the best taste for the caramel and it was very difficult to apply to the top of the cake slices). This is a two person cake though it feed four after a lunch. I think I got the toffee layer too thick on the torta pieces but it was nice and crisp. I followed the recipe I just did a jelly roll (Swiss slice) pan of sponge very thin and cut the baked sponge into many squares. Then I cut each square into halves to get thin layers of sponge. The Verdict - This is a very delicious torta and the addition of the coffe syrup really adds to the taste. The buttercream is sweet so I only used the bare minimum if you don't have a sweet tooth use unsweetened bitter chocolate in the buttercream this will counteract the sweetness. I like the lemon aftertaste in the caramel and even if it was thick it was crisp and a nice contrast to the softness of the torta. I did chocolate sponge layers (added some cocoa powder to the batter). I did a much better job of doing the caramel pieces this time I was very happy with them. I then filled the torta with coconut buttercream and bittersweet chocolate buttercream in alternating layers and garnished with moist fresh shreaded coconut. The cut torta I soaked the layers in strong coffee. The Verdict - Even better than the first one, the contrasting flavours and colours were delightful and this time I toned down the sweetness. I also like I had a nice close grained crumb in the sponge which was very nice to eat. Remember you are the boss and not the cake. I'm very bossy when it comes to torta. Below is the method I use to make layer cakes. It can be used to make thick or thin even layers. You will found that the edges will be slighter thinner than the middle but not by much. And making a great torta is about mixing and matching the cut-outs to make the finished torta even there will be some wastage. I used 1/12 (one half of an egg white and half an yolk) of the recipe to make a 30cmx30cm (12"x12") thin layer of torta for demonstration purposes below. 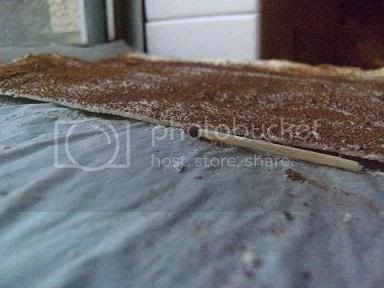 Prepare the baking paper – iron both sheets to make them flat and smooth. 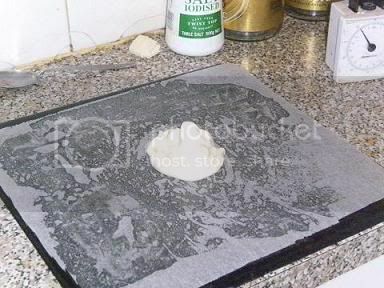 Then spray some oil spray on the baking sheet and place one sheet on it do not spray the top side. Then spray the other sheet and cover the oil evenly with cocoa powder (or flour). This is the most important step place some batter on the paper without the oil and spread as evenly as possible take your time and do a good job, the better you do here the easier it is to cut and you will have less wastage. Then place the other paper with the cocoa (or flour) on top of the spread out layer. The cocoa helps you remove the top sheet and helps when you spread the top of batter with the rolling pin. Now use a light weight 12oz (330grams) or less rolling pin and roll very gently over the paper, do it very gently, at first use your fingers to take the weight of the rolling pin then slowly and gently while rolling use the full weight of rolling pin, you shouldn't have batter coming from the edges this makes for a very flat even layer. Hold the rolling pin level to the pan with your fingers just below the height of the paper so when you roll gently the action is only making the top of the layer even. The idea is to even out the top of the batter and not move batter to edges. A good torta sponge can take the weight of the rolling pin and not move too much of the batter to the edges. This method does not work well if you haven't done a good job on spreading the batter onto the parchment paper in the first place. It makes for a very smooth flat thin layer when presentation is paramount. Bake in the oven, when you smell sponge it is ready this layer took about 4 mins and you will find that the top parchment paper lifts and puffs up from the sponge layer and makes for easy removal. If you are making very thin layers - when the sponge is still warm cut into the shape you require using a knife or scissors. How thin can you make the sponge. See for yourself I used scissors to cut the sponge. No the sponge isn't crisp in fact it is soft - I find that thin layers are nicest and hold the max amount of icing. The torta tower I made for the challenge used thin layers about a matchstick thick. It was only about a matchstick and half high and I used one egg (that is 1/6 of the recipe) enough for two people I had about 5% wastage of the baked layer near the edges. The sponge is not crisp also I usually use coffee or liquor to moisten the sponge when I make the completed torta. Lightly pressing the still hot unmoulded sponge cake with another unused sheet pan to level the top of the cake is the easiest method I think to make the sponge layers even and also I did spread the cold buttercream between two pieces of parchment to make those layers very even and then placed them in the freezer to make them hard and then cut them to the same shape as the cold sponge layers then I assembled the torta. Cold sponge is much firmer and easier to cut and handle than room temperature cake. This is how to make the most even and level torta you can. *Chill the torta between the filling of the layers and the final icing. The torta will be much easier to work with. *Apply a thin layer of icing to the torta then refrigerate until it is set before applying the final, heavier layer of icing. 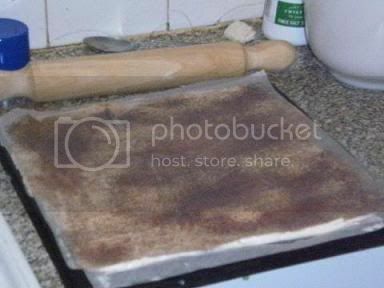 This will seal in the crumbs, ensuring a clean final appearance. 1.To split a cake into layers, loop a length of waxed dental floss around the outside of the cake at the point you want the cut, then cross the ends and pull gently but firmly. The floss will cut right through the cake. 2.An easy way to split layers evenly: Measure halfway up side of each layer and insert wooden picks into the cake all around, about 1 to 1 1/2 inches apart. Rest a long serrated knife on wooden picks, using them as a guide on where to slice. Discard wooden picks before proceeding with the icing. How to ice many layers at once and keep them straight. 1.If tiers of a multi-layer cake slip as you are applying icing, insert strands of uncooked spaghetti through the cake for support. Carefully pull out spaghetti when the icing has set. 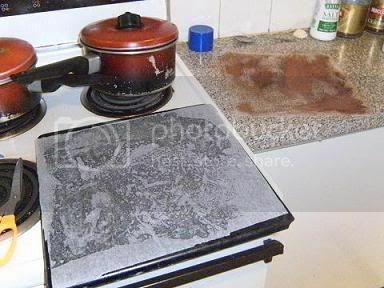 2.To prevent icing from running off your cake, try dusting the surface lightly with cornstarch or cocoa before icing. When testing a large cake to see if it is done, use a strand of uncooked spaghetti. It reaches where a wooden pick won't. Use unflavored dental floss to slice evenly and cleanly through a cake or torta. Simply stretch a length of the floss taut and press down through the cake. Shape: The traditional shape of a Dobos Torta is a circular cake, but you can vary the shape and size if you want. Sherry Yard in her book Desserts By The Yard makes a skyscraper Dobos by cutting a full-size cake into four wedges and stacking them to create a tall, sail-shaped cake. Mini Dobos would be very cute, and you could perch a little disc of caramel on top. This looks phenomenal! I am so sorry I had to miss out on this challenge. wow, really really great instructions. i wish i had seen your post before i made mine and put the coca on the layers! Outstanding as ALWAYS!! I love the coffee spritzing idea, I found that my torta really wanted either a spray of liquor or coffee on each layer (I neglected to do that though!). 32 layers - stunning! Your tips & tricks are priceless. I starred this post so that I could remember to follow them in the future :) Cheers! Thanks for posting all your tips in one place. Very helpful. Good job. Wow u made two tortes with 32 layers, Amazzing!The layers are very even. Amazing, Audax! You baked up a skyscraper!!! They sound and look delicious! What a superb effort. Two versions, and one with 32 layers. Amazing. Amazing. I love the idea of adding coffee syrup. That would have tasted amazing! Great job Audax - and everyone appreciated your tips. Fantastic job!!! You're friends and family would be loving all these challenges and your mammoth efforts too! Great job as always Audax. Love that coconutty twist! 32 layers! *gasp* Those layers are phenomenal! WOW, I love all the layers, stunning! I heard you did 32 layers and had to come and see for myself. I missed this chalenge, but am saving it for later. Well done and informative post. looking at those fine layers after layers makes me drooling of forking in for a taste! perfect! Bowing down to your amazing effort. I can't believe you made soo many versions, with each torte consisting of soo many layers. I had soo much fun making mine, but don't think i'd be handle doing what you did. Once again, I'm in awe of what you've made, can't wait to see your take on the next challenge. Wonderful job on your torta. I really enjoy how you play with the flavors... The coffee soaking sounds delicious and seems reminiscent of a tiramisu. Billiant stuff here Audax. Those 32 and that matchstick are going to haunt me forever! PHENOMENAL!!! Audax, your creations are simply spectacular! I love you Dobos torte! It looks decadent! Thanks so much for all your tips on this challenge! Your tortes are inspirational! As usual i'm completely blown away by what you've created. As usual, your creations are splendid! I love those perfect layers and those dainty little cakes! Before I go back and study (yes, study!) your step by step and tips, I just wanted to say WOW! Shouldn't something this dizzying be illegal? Oh my oh my you have once again outdone yourself AND made it all look so ridiculously easy! Beautful, mouthwatering Dobos Tortes! this is a serious layered cake audax! wow! love all of the tips and tricks here. thanks for this. an amazing job! Wonder if that's the most layers that someone has put to this challenge? Audax, you are the epitome of a DARING BAKER... never would I have dared to go past even 10 layers! Great job and once again, thank you so much for sharing all your knowledge. c'est incroyable Audax, tous ces étages ! ça c'est du gâteau étagé ou je ne m'y connais pas ! magnifique ! Just amazing, though I think you out did yourself with this one. Amazing job--above and beyond, as always. I love your tips for even thin layers . . . So clever! Every month I learn so much from you, it is like Audax's baking school. :) Beautiful and creative, as always. I actually think it was your creations that kept me inspired to finish the challenge this month. I was so busy I was tempted to wimp out. You have so much patience that is unbelievable. Audax - What can I say? Your tortas look stunning =D. Wonderful job, and I love the tips! Once again, another stunning and informative post! You continue to impress and spoil us! You did a great job - as always. I love the addition of coffee syrop and your second torte looks so beautiful and very delicious :) Cheers from rainy - still no sunchine... - Ireland! thanks so much for the inspiration and the step-by-step instructions on how to perfect the layers. Super impressive. And I like the idea of coffee-soaked layers. My layers needed more moisture! i am so impressed with your layers! great great great job! Thank you for all the great instructions and tips! I know where I'll be going for help if I make this cake again! I think they are all just lovely! Fantastic cakes as expected! Thank you for all your tips and tutorials on the forum. Thanks for all the great tips and tricks! Both of your tortes sound wonderful. I used a coffee syrup and I like the idea of just using strong coffee much better to tone down the sweetness. Very instructive post again! Your tortes are beautiful as always and I certainly learned a few cake-decorating tips from you. Thanks very much! 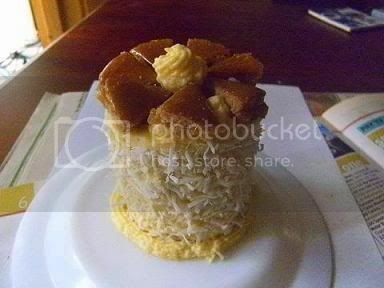 I was really impressed teh first time I saw that... Condo-bos torte! Kudos to you and thank you for sharing all the details! you are AMAZING! look at those layers! Audax - Thank you so much for all of your encouragement and tips throughout all of these challenges. Your tips on making thin, level layers saved me from a very late night, last night. Both of your Dobos look amazing and delicious. Once again you amaze us all, Audax! Great hints and tips and lovely flavors! Great job Audax! I could only dream of achieving your multiple cake layers! Holy *#$%&!! Those layers are AMAZING! 32 layers...you are a force to be reckoned with! Audax, you have done the most perfect layering in the entire contest. And thanks for sharing with us your layering technique! Awesome! What a wonderful Dobos Torte! 32 Layers - very impressive! I love your coconut - chocolate version. Wow 32 layers is unbelievable!! Congratulations! WOW - both are soooo beautiful!! Amazing job! You never cease to amaze me. When you are not testing with colors you are inventing flavours and textures... obviously here, you defied the laws of gravity with you mile high Dobos! Aud, I'm so sorry I spelled your name wrong. Going to fix that ASAP! 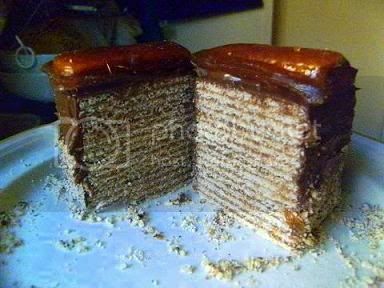 That said, even after seeing your first Dobos at the DK forum, I'm still speechless at the amount of perfect layers you got. I don't think I could ever get them that thin and end up with like 32, and so perfectly stacked and clean. Also, I'm in lust with the coconut Dobos! I am just floored at your million-layer dobos torte, it's like nothing I could dream of making! Seriously, amazing work! You always go above and beyond for these challenges. Thanks Audax for all your kind word, support and generosity to everyone in daring Baker's. Your Dobos Tortes are fantastic. 32 layers are generally only done by top notch pastry chefs so that is saying it all about you. You are a wonder. Simply the best. I wanted to try your layering method. Unfortunately, I didn't have a pan large enough for the rolling pin I purchased and then I ran out of time so made the circles instead. I have finally done some macarons. Will blog about it soon. Delightful tortes, and wonderful instructions and tips. I'm especially impressed with your toffee bits in the later versions, they are perfect! And coffee flavours was a great way to go! Such a wonderful job and post. 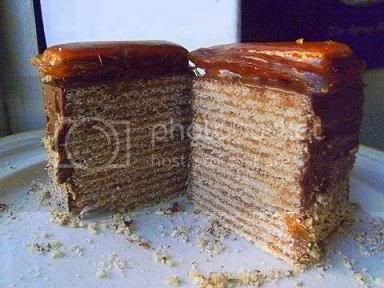 I love your 32 layer Dobos. You are so full of informative ideas thanks for sharing them. Stunning! Exquisite! Works of art! What else can I say other than that your blog is a pleasure to read. Wow 32 layers you must have a lot of patience. Well done. Audax, your tortas are simply fantastic. I really like the flavors of the second one and might give Dobos another try. And thank you for all the tips and hints! You most definitely are the boss of this cake! Thirty-two layers is just beyond my comprehension right now, but it certainly makes for a gorgeous slice! Wow! I love the way the one with the 32 layers looks! Fabulous job! Amazing!! 32 layers are just incredible! You know you are Awesome...right !!! I have never seen so many layers in a cake - amazing! HI Audax, you always seem to be first and I have a feeling I always seem to be last to post ;o) even though we are both on the same side on the world! Your's look amazing, you have so much patience. Your torta's are a work of art! I LOVE how you give us details. Such a lovely post. I appreciate all the hints you provide us on a monthly basis in the land of DB's. You are so so passionate about this. I love this. And you have put so much effort into these stunning cakes. You are really special. Check out my blog, I have a little gift for you. Wonderful results! I like how you did 2 totally different tortes. Thanks for all the help and tips along the way! As always, a magnificent job Audax! I absolutely love love LOVE the coconut/chocolate version.. wow, that sounds amazing! Thanks for all the tips, very helpful! u are truly inspiring in everyway~ :) awesome job again. Are you insane??!!!! 32 layers?!!! I'm very impressed!!! Wow, Audax! You are just so amazing in the kitchen! 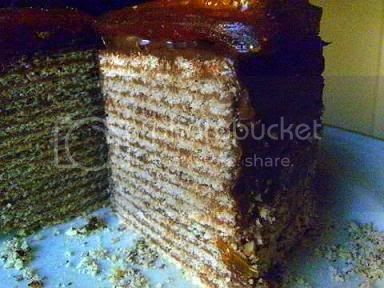 Sadly, this was my first uncompleted challenge, but I still posted a little "blurb" about it on my blog, and pointed my readers to your blog, to see an exquisitely completed Dobos Torta. Ciao ! You are just too much !! Great ! I do love all the super-thin layers! Once again, wonderful job. FANTASTIC Audax!! Always all your creationes are amazing. 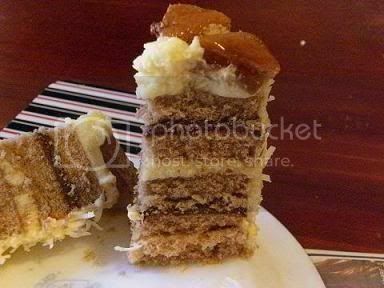 Your Dobos Torte with 32 layers is incredible= I'm wide-eyed!! 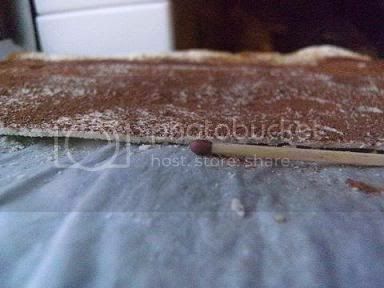 Beautiful torta Audax, I love the picture with the matchstick, very usefull tips that I'll keep for my next torta. By the way there will be a concetration against the president of my country in you country in Sidney "no more chavez" is the name, I hope my dear Australians meet there. Hi Audax! I have a little surprise for you on my blog: http://singinghorse.vox.com. When it is convenient, please check it out. Thanks! WOW! Absolutely WOW! Your torte is amazing. I am so impressed with the 32 layers. I found it difficult to make just 5! Great job! That's what I call variety!!! Great job on this month’s challenge.